I am very excited to share my birthday cake with you. This cake recipe comes from one of my fellow #BundtBakers, Tux over at Brooklyn Homemaker. Back in April we were tasked with the theme of “hidden surprise.” I have been sitting on his recipe for four months just waiting to make this cake my birthday cake. Why? Because key lime pie is my absolute favorite dessert and he took it to the next level with our shared love of beautiful bundts! 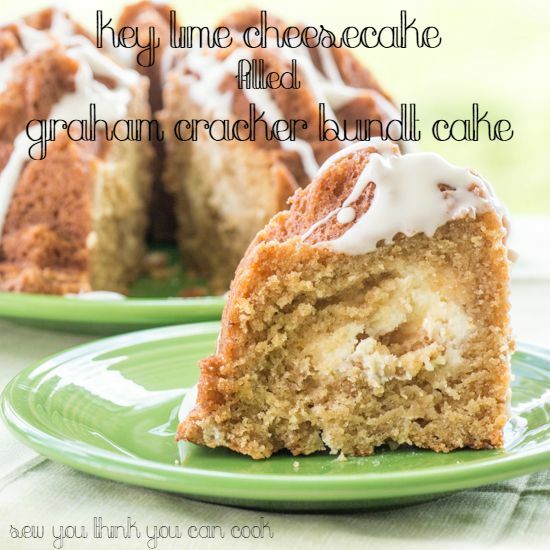 The “hidden surprise” inside a graham cracker cake batter is a key lime cheesecake. Thank, Tux, for a fabulous cake recipe worth of anyone’s special day! Preheat oven to 350 degrees F. Heavily grease bundt pan. In the bowl of a stand mixer fitted with the paddle attachment, beat together the butter and both sugars. Add the eggs one at a time, mixing until incorporated. Add the vanilla extract and mix until combined. In a bowl, whisk together graham cracker crumbs, flour, baking powder, and baking soda. Alternate adding the dry ingredients and the buttermilk to the stand mixer, beginning and ending with the dry ingredients. Bake cake 50-60 minutes until a cake tester comes out cleanly. Allow cake to cool at least an hour in the pan before turning out onto a cooling rack. Make the glaze: In the bowl of a stand mixer fitted with the paddle attachment, beat together the cream cheese and powdered sugar until there aren’t any lumps. Add the key lime juice and as much of the milk as needed to achieve desired consistency. Drizzle over cooled cake. They say you eat with your eyes first. That must be true because viewing the stunning food photography by Jessica of How Sweet it is caused me to try this intriguing flavor combination: chipotle, strawberry, and black beans. I admit, I added the black beans – the addition that really had my husband scratching his head. Instead of eating this Mexican Monday meal as tacos, we had tostadas. And tostadas call for refried beans to act as the “glue” that holds the meat and toppings in place. I didn’t think traditional refried beans would really be the way to go with shrimp so I opted for refried black beans. I’m very relieved to inform you that it worked! I cut some serious heat from the original recipe and I still found it to pack on the spice. Because I freeze my chipotle in adobo in ice cube trays I never know until the cube thaws if I have just sauce, just pepper, or a combination of both. Jessica’s recipe calls for the sauce to be in the marinade – instead I had a pepper which I cut in half and tossed in the bag. This method is a great alternative if you don’t want too much heat but still want that smokey spice from the chipotle peppers. Additionally, I only used half of one (large) jalapeno instead of two whole jalapenos in the strawberry salsa – by all means, if you like it spicy add as much jalapeno as you like! Place all ingredients in a bowl, cover and refrigerate 30 minutes. Cook shrimp 2 minutes on each side. I did this on a lightly greased grill pan. If you cook the shrimp in a skillet, add 1 tbsp of olive oil. 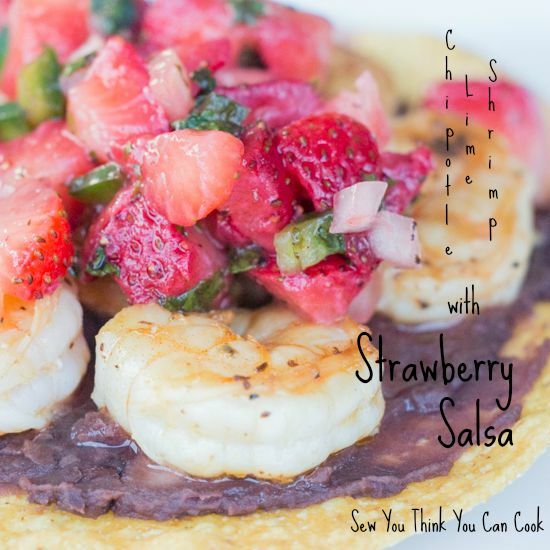 Serve shrimp with strawberry salsa (recipe below) in a taco with lettuce and cheese or as a tostada with refried black beans and cheese. Combine all ingredients and season to taste with salt. Refrigerate until ready to serve. My New Year’s Resolution for 2015 is to create at least one original recipe a month. I created three new recipes in December 2014! All three were spurred from a case of the empty fridge. But it gave me the idea to adopt a New Year’s Resolution. If I hope to expand my presence in the food community (ahem, Food Network, are you listening?) then I need to have recipes of my own. I also can’t create a cookbook of “copied” recipes! Everything stems from my ability to be creative in the kitchen. And the only way to test that ability is to give myself a challenge/goal. And with this homework assignment every month I can create my grocery list based off of my idea – not create my idea based on my pantry supply. Today’s post is one of December’s recipes. 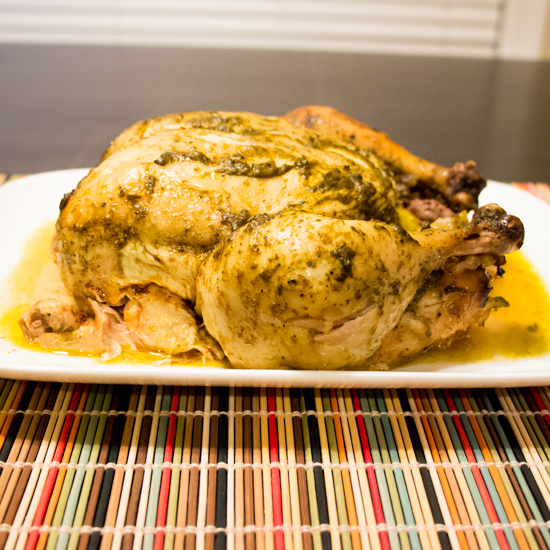 In fact, it’s one that I made before leaving town for Thanksgiving and then tweaking into the recipe I post today. The first version of this dish, while tasty didn’t feel Mexican. I added garlic, salsa, and cumin. I reduced the amount of liquid and omitted the corn. As much as I love corn it didn’t quite fit with the shredded chicken and got lost. In the photo below you can see how different the two versions are; version 1 is on the left and the final version is on the right. What I love most about this recipe is its versatility. My favorite way to eat it was as nachos. 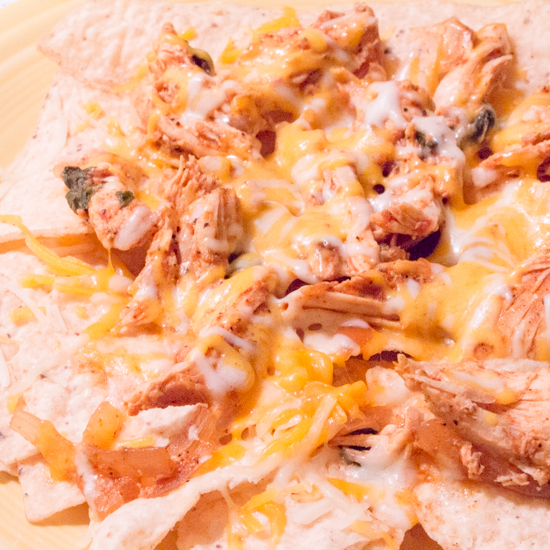 I put tortilla chips on a plate, topped them with the shredded chicken and shredded cheese. I microwaved the nachos for 30 seconds until the cheese was melted and dipped in salsa. The shredded chicken can also be rolled into a burrito with beans, rice, and cheese. Or use it to top some flavored rice. Create a sandwich with the chicken, salsa, cheese, and lettuce. Even stuff it in a lettuce wrap for a carb-free version. Season chicken with S+P. Place in the bottom of a slow cooker. Top with onion, garlic, and jalapeno. In a bowl, whisk together stock, salsa, lime, taco seasoning, and cumin. Pour over chicken. Add cilantro to the slow cooker. Cook on LOW 5 – 7 hours or HIGH 3 – 5 hours. Shred chicken and return to sauce until ready to serve. 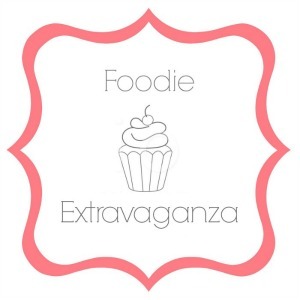 Welcome to day two of #10DaysofTailgate hosted by Camilla of Culinary Adventures with Camilla. Today I have a perfect recipe for those early morning tailgating sessions. While night games have a great atmosphere, my favorite games to tailgate for are the early afternoon ones. I love having breakfast themed tailgates, going off to the stadium, and then returning to the tailgate site to have dinner. Win or lose, it’s fun to end the evening on campus – enjoying some drinks, more food, and tossing a football. The breakfast tailgating spread includes coffee, bagels, muffins, and fruit. The only problem with having fresh fruit is that it attracts flies. 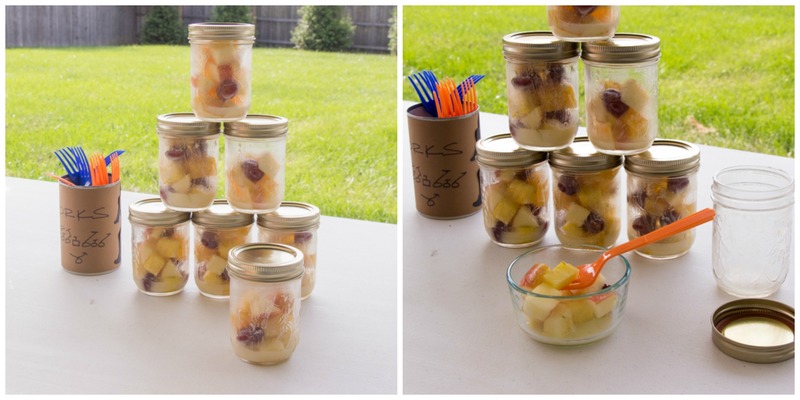 By putting fruit salad in individual mason jars, the fruit can stay cold in the cooler and the flies will stay away. They can also be prepared in advance. You can use whatever fruits you like, whatever is in season, or whatever fits with your team’s colors! With a lime dressing, I picked fruits that would be brightened up by the citrus flavor. In a small bowl, whisk together yogurt, honey, and lime. Set aside. In a large bowl, gently toss together fruit. Add dressing and toss until all of the fruit is coated with the dressing. Spoon into individual mason jars. Keep cold until ready to serve. Today’s edition of Mexican Monday requires prep on Sunday, even though it’s a slow cooker dish! But that’s also what makes it perfect for your Monday, whether you follow my Mexican Monday Menu plan or not. The chicken needs to marinate over night, but in the morning all you have to do is drop it into the slow cooker – no chopping, no measuring! 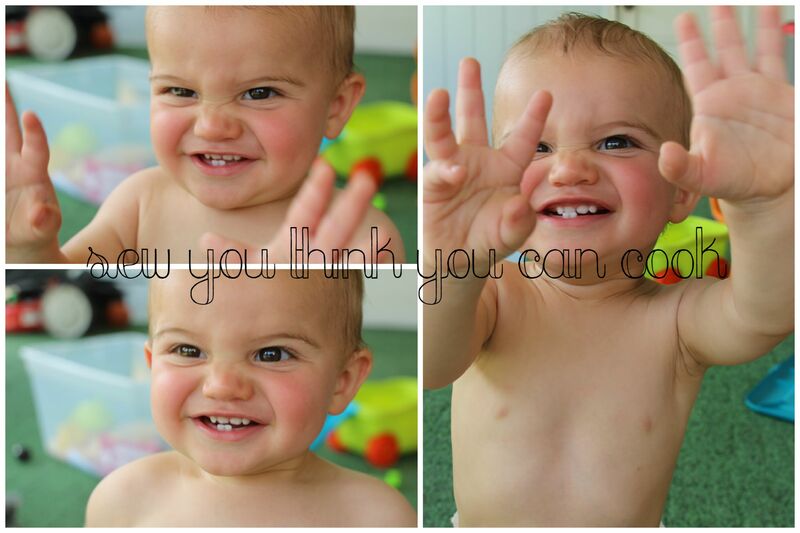 I found this recipe on a Pinterest post of Paleo Slow Cooker Recipes. Although we don’t follow the Paleo diet trend in this house, I may have some readers who do. Or maybe I’ll get new readers from it! 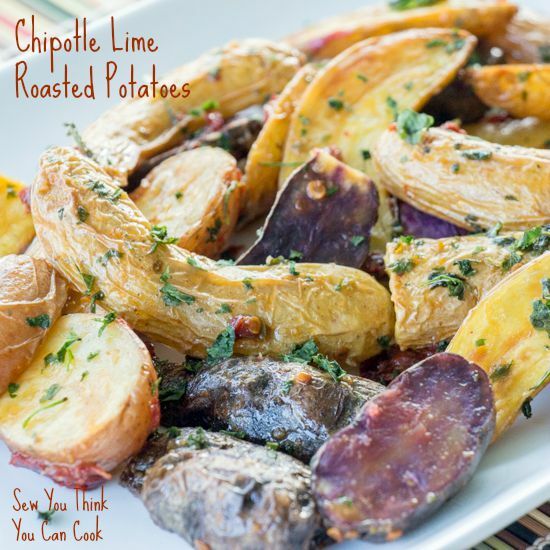 😉 If you’re looking for new Paleo inspired recipes, check out Jason’s blog, Paleo Pot. But because we don’t follow Paleo, I served this chicken with Rice and Beans! Mix together pepper, salt, cumin, cayenne, and chili powder. Dry chicken and rub spice mixture over entire chicken. Poke holes in the whole lime and rub with spice mixture. Place in chicken cavity. In a food processor (I actually used the single serve unit for my Ninja blender, a Magic Bullet would work great too!) combine lime juice, garlic, cilantro, and olive oil. Place chicken in a large resealable plastic bag with the marinade. Marinate over night. 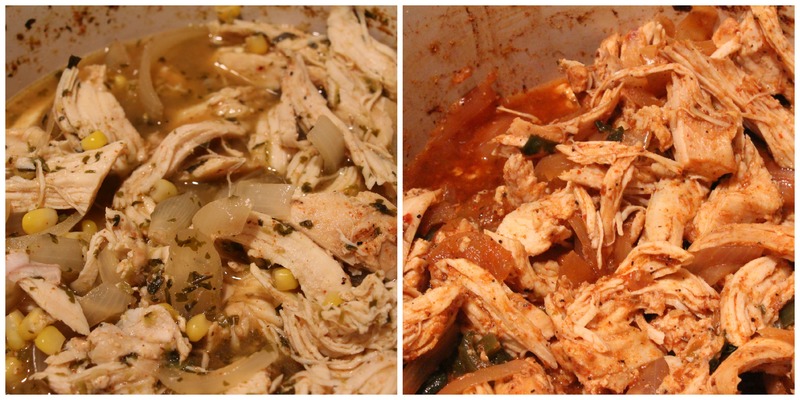 Put chicken, breast side up, in slow cooker with the marinade. Cook on LOW 5-6 hours.